Here are some other things that have happened this week. The wonderful happy-making tide of postcards, letters and New Home cards has continued. The mantelpiece in DorkySon’s room is creaking under the weight of them, and they make us all smile every time we walk past. A beautifully wrapped parcel arrived in the mailbox. It was addressed to DorkySon, and when he’d carefully peeled away the layers of tissue paper and ribbon, he found a copy of Dixie O’Day’s Life in the Fast Lane. It’s a wonderful new book, written and illustrated by Clara Vulliamy and Shirley Hughes, and when Clara saw me wondering aloud on Twitter whether it was available yet in Australia, she took it upon herself to send DorkySon a signed copy. DorkySon was beyond thrilled. Another mystery parcel arrived. 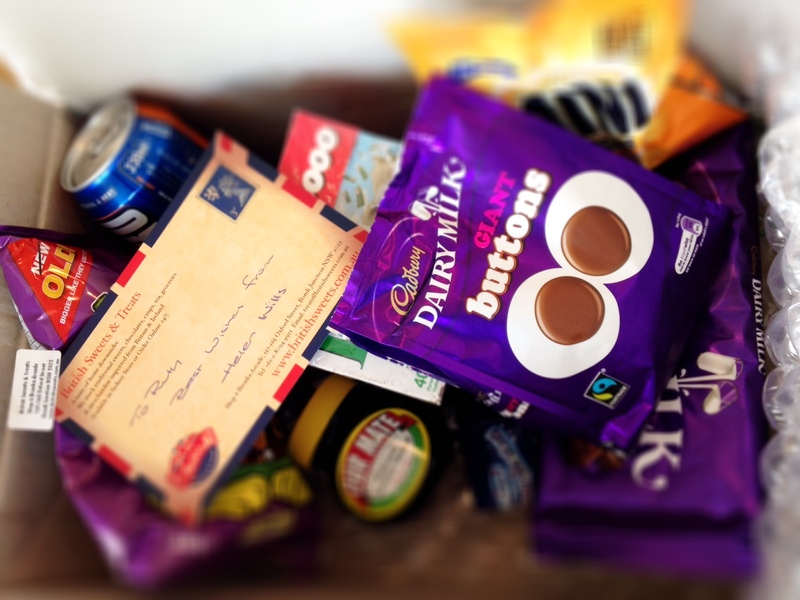 This one was packed full of British treats – Marmite, Irn Bru, PG Tips, Monster Munch, Cadbury’s Buttons – exactly the kind of things you might long for if you were living in a new country and having a wobbly day. I am bowled over by the epic generosity of the blogging friends back in the UK who organised it, especially Helen at Actually Mummy, who tracked down the Aussie-based ‘British Sweets and Treats’ site. In fact, I am bowled over by it all. By the generosity of friends – some of whom I’ve known for years, some of whom I have met only once or twice, and some of whom I have never actually met. The fact that those people would take time out of their day to make such kind gestures, to help us feel settled and happy in our new country is just lovely. I have written a lot on here in the last few weeks about how friendly and welcoming the people of Hobart have been. But this week has reminded me of the kindness and sweetness that we already had in our lives. It has reminded me how hard other people have worked to make this transition as wobble-free as possible. It’s hard moving country because although you find lots of lovely new things you’ll always be missing others and even if you were to return it will be the same believe it or not. 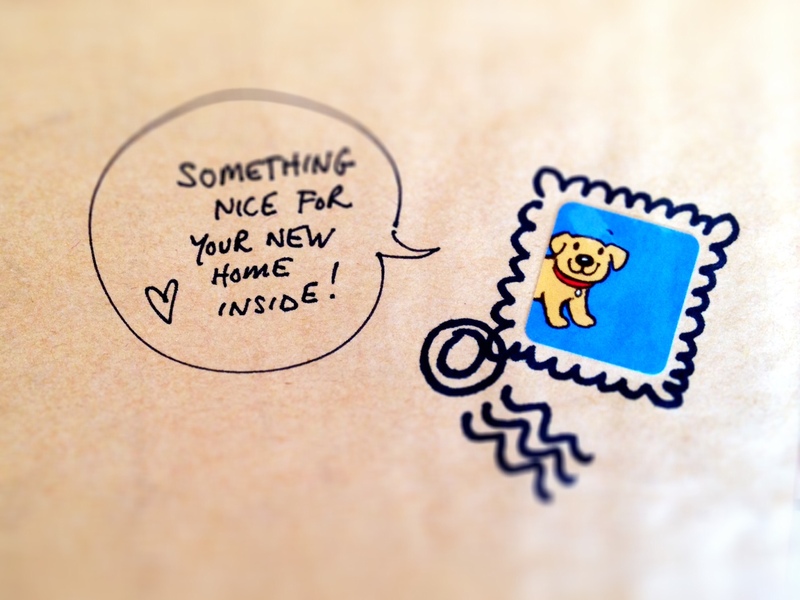 OHHH what a brilliant parcel – I am going to look for that and send something to my friend that lives in Sydney! I am loving reading your blog lately, we are perhaps at the beginning of a similar adventure and the wobbles scare me silly!! so glad to read you have some fab support, think that is what makes it easier right? Oh Ruth I hope you’re feeling less wibbly wobbly now.I think you’re all very brave so it’s all justified. Aw, lovely! Lois loved that book, it’s gorgeous. Can’t believe you didn’t have chocolate in the house…. No chocolate in the house is a terrible thing on those wobble occasions. At least you had wine.